When are where was the photo taken? 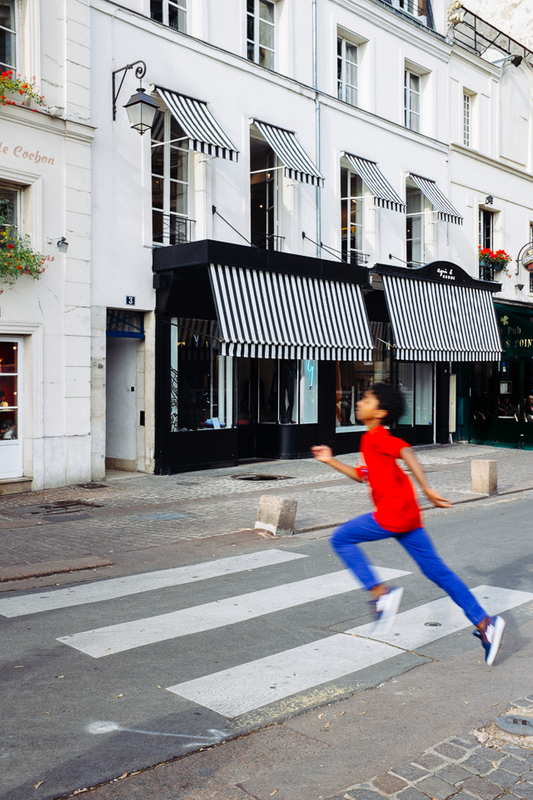 Adam Riley and I were strolling through a chic part of Paris and we spotted this monochrome scene with black and white paint on the road and striped canopies. There was a very dandily dressed young Parisian man outside the shop with black and white stripy socks, all of this caught my imagination and I had to linger and wait for the scene to come together. I was hoping at the time for an attractive lady to cross in colourful attire. I was about to give up after standing there observing for sometime, and Adam and I were in conversation I spotted a boy running towards us from over Adam’s shoulder. The splash of colour I had been waiting for. I shot one frame on the Fuji x100s and that was the image you see here, I am not one to keep checking the back of the screen on cameras but this was one I had to check immediately. Was this a lucky shot? I believe you often have to create your own luck in photography, and shooting street photography is no exception, I intended to shoot a monochrome scene with a splash of colour, the unexpected is what street photography is all about and I did not expect for one minute to get such a colourful dressed boy jumping into the scene with such flair.